7th August 2014: The DDJ-SX2 is the industry’s first controller to give DJs dedicated control of the new Serato Flip functions within Serato® DJ . Serato Flip is an expansion pack for Serato DJ that gives DJs the power to record and re-play hot cue sequences on the fly. The DDJ-SX2 is the only controller with designated buttons – Record, Start, and Slot – to put intuitive Serato Flip performances at their fingertips. The four-channel DDJ-SX2 builds on the popularity of its predecessor, but inherits two must-have features from the top-flight DDJ-SZ: Performance Pads with velocity sensitive, multi-colored LEDs and on-jog digital cue point markers. 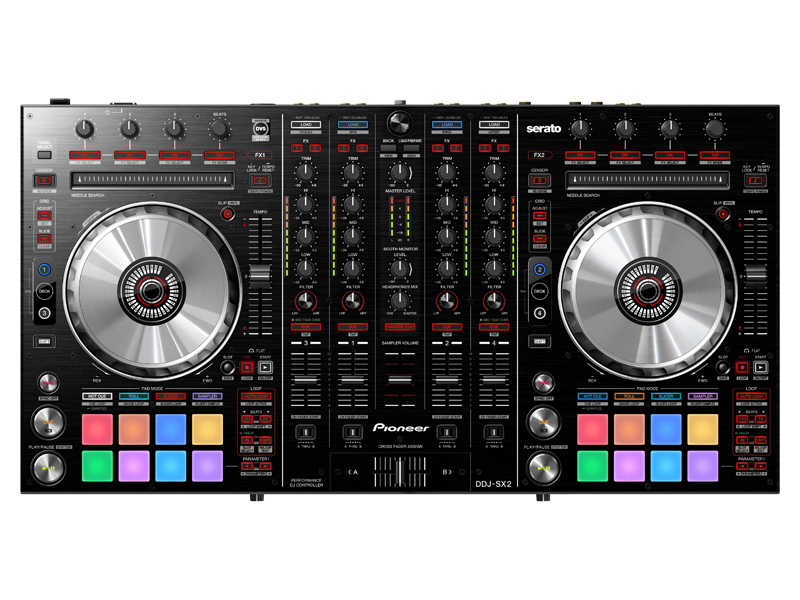 The DDJ-SX2 is also Serato DJ DVS upgrade ready and boasts improved jog wheel reaction time. Serato Flip is a new function in Serato DJ that lets DJs record hot cue combinations and replay them on a loop. DJs can record themselves triggering cues using the Performance Pads and automatically loop the sequence back on demand. Up to six recordings (slots) of Hot Cue sequences can be made for playback at a later time. Pioneer added Record (start/stop recording), Start (start/stop loop), and Slot (store) buttons to quickly access the Serato Flip operation. Multi-colored Performance Pads – Introduced in the top-of-the-line DDJ-SZ, the DDJ-SX2 now incorporates the highly attractive and functional multi-colored Performance Pads that control eight types of Serato DJ functions. The various illumination colors provide quick identification of the different actions/commands such as beats and drum rolls. The eight pads located below the Jog wheel offer HOT CUE, ROLL, SLICER and SAMPLER functionalities. While in velocity SAMPLER mode, the output level from the pad can vary depending on the strength of each tap from the user. Amplified MIC Input – Improved from the first generation, the controller features a balanced microphone (MIC) input circuit to provide clear audio output with no distortion regardless of the type or brand of microphone used. The controller can deliver clear audio even at high volume levels because of increased headroom and highly improved signal-to-noise (S/N) ratio. High Accuracy Jog Wheel – The output reaction time of the JOG wheels is significantly improved, further cutting down on latency, ensuring tasks such as “scratch” performances are at their highest levels. The model also features “Hot Cue Countdown” providing users, via its JOG Display, with the time remaining to a Hot Cue point, helpful in quickly arriving to a specified position in the music playing. 4-Channel Mixer – The DDJ-SX2 features an independent 4-channel mixer that can be used with other external sources such as turntables. Its master level meter provides instantaneous sound level adjustment as well as independent output controls with a display indicator for each channel when used as a standalone mixer. The DDJ-SX2 features four external inputs for connection with CD players, analog turntables, microphones and more, with the ability to act as a stand-alone mixer (without the need to connect to a PC/MAC). The controller includes two Master Out and one Booth Out outputs for connection to external public address (PA) equipment. The DDJ-SX2 also features support for the Serato DJ DVS function. Users will have the ability to purchase Serato’s DVS Expansion Pack and perform Serato DJ deck control on the DDJ-SX2 with Pioneer CDJ players or analog turntables. Channel Fader Start – Enables use of the channel fader to control and play/cue tracks. What should I do when an error appears after opening DDJ/XDJ audio driver?